Nicholas Bisciotti's Blog: SharePoint 4.0: Records Center Behaviors? or Bugs! SharePoint 4.0: Records Center Behaviors? or Bugs! I have been busy developing a proof-of-concept (POC) environment based on some design patterns involving SharePoint 2010 Records Center and Search. In this POC, Records Center is acting as a top level site collection and is storing quite a bit of content. There are numerous content types and site columns, carefully planned and configured on the site collection, to support tagging Records Center documents with lots of metadata. In this POC environment, I have dedicated a Web application to Records Center and for discussion purposes, the URL of the site collection can be http://recordscenter.domain.com. As I write this blog post, it is December 13, 2010. My SharePoint 2010 environment is running at version 14.0.5128.5000, which reflects RTM with the October 2010 Cumulative Updates. The SharePoint Foundation and SharePoint Server DLLs, and SharePoint Database are all current with the same version. I have tested with Site Collection Publishing and Site Publishing features enabled and disabled. During the testing process, I have discovered some unexpected behaviors related to Records Center. Microsoft Support may stamp these with the trusty "By Design" label, but since I am currently in the process of pushing these issues through the Microsoft Support channels, I cannot speak to their response at this time. I do know that these behaviors are inconvenient and troublesome. Below is a list. A. Cannot template a sub-site beneath a Records Center site collection. 1. Start from a Records Center site collection. 2. Create a sub-site using the blank site template. 3. Attempt to save the site as a template. Problem: Error: An unexpected error has occurred. B. Cannot export a document library and then import it as a different name, in a Records Center site collection. 3. Create a document library in the blank sub-site. 4. Using STSADM, export the document library to a .cmp file. 5. Using STSADM, import the document library .cmp file, as a different name. Finished with 15 errors.A list, survey, discussion board, or document library with the specified title already exists in this Web site. Please choose another title. Problem: Error: The .cmp file cannot be imported because an existing document library having the same title (different than name, which affects the document library URL) already exists. This behavior might make sense in a Records Center given the Content Organizer and its functionality which routes documents, based on content type, to appropriate document libraries using the Title of the document library. Still, templating document libraries in a Records Center is especially important, since Records Center typically have well defined site columns. 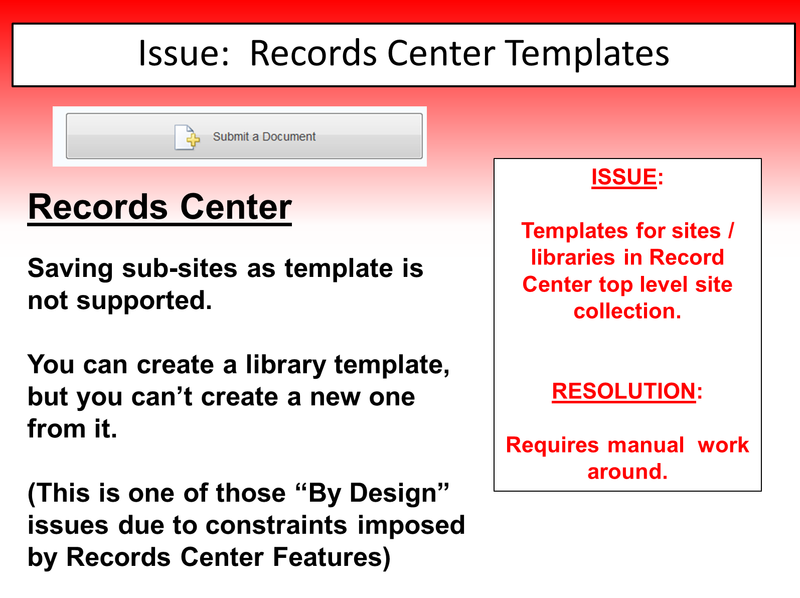 It is only natural that we will want to template document libraries efficiently in a Records Center. Microsoft SharePoint Team Blog (2010, December). October 2010 Cumulative Updates for SharePoint & Project Server 2010 Republished. Retrieved December 13, 2010 from http://sharepoint.microsoft.com/blog/Pages/BlogPost.aspx?pID=957. Microsoft Support (2010, October). Description of the SharePoint Server 2010 Cumulative Update Server Hotfix Package (MOSS server-package): October 26, 2010. Retrieved December 13, 2010 from http://support.microsoft.com/default.aspx?scid=kb;EN-US;2394320. Microsoft Support (2010, December). Hotfix Request. Retrieved December 13, 2010 from http://support.microsoft.com/hotfix/KBHotfix.aspx?kbln=en-us&kbnum=2394320. Came across this older blog of yours -- did Microsoft ever come back with an answer? This still seems to be an issue into SharePoint 2013.